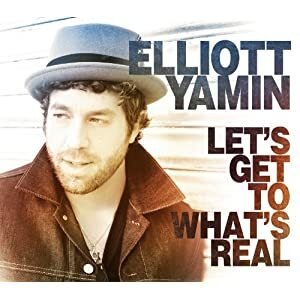 Before I start this review, full disclosure is needed: I was not a big fan of Elliott Yamin during his run on American Idol, and when I picked up his debut CD in 2007 I felt justified in not really being a fan of his. Fast forward five years and one skipped sophomore album, and I feel now is the time to see if Elliott can change my opinion of him. Let's Get To What's Real is the third album for Elliott and this time he decided to take more control. He brought in longtime collaborators Brett Nolan and Aaron Goldstein to help write and produce the album with him. This is the first album Elliott has put out that has used the same producers for the whole record. The album is an eclectic compilation of songs that takes you from 1970s jazz/rock, to boyband pop, to soul all in one journey. At times you are lost in a world where a simple piano man is telling a great story, and others put you out on the dance floor grooving to the sweet sounds of horns and keys cranking out that hard-hitting music of yesteryear. And then after all that you are back in high school (at least for this writer) listening to the rise of the boybands once again. The interesting thing about all of this is that it actually works well. "Let's Get to What's Real," "Enough Love," "Up, Down, All Around" and "Downtown" have a very Motown vibe to them. It's a soul-filled, jazz vibe right out of the sixties and seventies. Driven by horns and funky bass lines, these songs transfer you back to that smoke filled club of the seventies where people are shaking their goove things all over the dance floors. "Thinkin' Bout You" and "Poison" are songs that would fit easily into the catalogues of boy bands like New Kids on the Block, Backstreet Boys and N-Sync. Songs like "Virgina" transport the listener to the days of the late seventies, early eighties where piano men like Billy Joel and Elton John ruled the music world. It has that kind of vibe to it. "I'll Be That Bridge" is a groovy, ballady song that makes you want to sway your hips and reach to the sky. It was written by co-producer Brett Nolan's father Kenny Nolan, who penned songs like "Lady Marmalade," "My Eyes Adore You" and "I Like Dreamin'" in the '70s. "Self Control" and "Gather 'Round" are solid piano-driven songs that kick off the album. They have good beats and are fun to dance to. "Self Control" is my favorite of the two easily. "3 Words" is the lead single from the album, and it was a great choice. The song is full of great emotion, great singing by Elliot, and great story. I found myself really moving to the song and enjoying the heck out of it. As a whole, Let's Get To What's Real is a fun trip back to the funky days of the seventies. It isn't disco, and it isn't Woodstock, but it has that feel that was brought on by bands like The Commodores and The Four Tops. To me it is a much improved album from 2007's self-titled debut. If you are a fan of Elliott from his American Idol days, this is the album you have been waiting for. It may not be the best album from an former American Idol contestant, but it is definitely a solid effort and a much improved sound for Elliott. Check out the video for the lead single "3 Words"